Solar Power Bank 10000mAh Dual USB Charging Waterproof Powerbank External Battery Solar Panel Charger With LED Light For Phone. Please notice that this power bank is virtually indicated 20000mah but only has 10000mah real capacity. 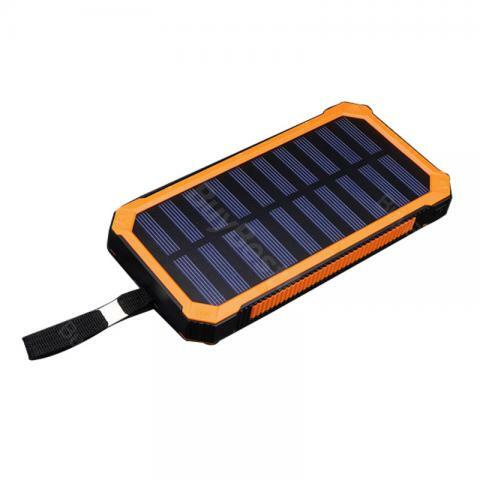 The Solar Charge Power Bank, specially designed to suitable for a variety of cellphones . It's easy to carry for various outdoor activities. Please notice that this power bank is virtually indicated 20000mah on the package but only has 10000mah real capacity, which you need understand and accept before the purchase. • Solar charging is supplementary for emergency use, do not reply on it for full charge. I recently purchased this on 9-11 during a prime lighting sale. During the summer my city host outdoor festivals which I volunteer for. There is a lot of down time so I use my phone often and I thought that I would give this a shot. I can't say how long it takes to top off in the sun because I charge it when i get home. I can get about 3 full charges on my phone which which did come in handy. I can recommend this product. A very powerful power bank. When I used it at an amuse park, the power level didn’t go low quickly. I guess the solar panel worked great as well because the 4th blue light indicator was flashing when it's exposed under the sun. Also, the orange/black-sport-look is very fancy to match with a backpack. The bonus for this power bank is the LED light which is a super excellent extra light source for selfie. Worth the money. Highly recommended. I use this to charge my bluetooth speaker that I use once a week at a dance class and I keep the speaker connected to this battery charger and so far my speaker has never run out of battery. The light is also useful. I don't trust the hook, wrapping it with some paracord for better support. I love to go camping. I always had a problem to charge my smartphone or camera. It was challenging for me because every solar charger I had before needed more than three days for full charge. This solar charger is best I ever found because it needs two days for full charge. Also flashlight is very useful. When I first got this charger I would charge it up by putting it in my attic, south-facing window. But, that didn't do a great job - not nearly as good as putting it out in my backyard facing the sun. In the past, I had a less expensive solar charge (just one solar panel, not 3) which was for me a waste.